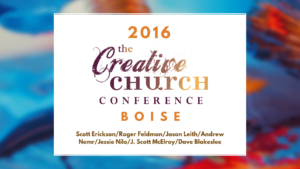 The CreativeChurch Arts Conferences were conceived by J. Scott McElroy (New Renaissance Arts Movement) and Jessie Nilo (VineArts Boise) as biannual national gatherings in the summer of 2012, designed to inspire and equip churches and artists for arts ministry. The idea was sparked by a desire to share the material they were gathering for Creative Church Handbook: Releasing the Power of the Arts in Your Congregation, which was eventually published by IVP in 2015. The producing partnership between New Renaissance Arts Movement, VineArts Boise, Vineyard Boise, and Indy Vineyard Church continued from 2012-2016. 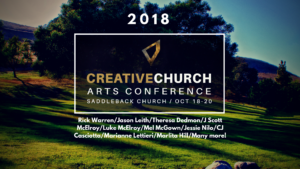 In 2018 Saddleback Visual Arts and New Renaissance partnered to produce an expanded version of the conference at Saddleback Church’s Rancho Capistrano campus. To date we’ve co-presented 6 conferences and produced nearly 60 videos of sessions and workshops, all available HERE. The most recent conference was presented by Saddleback Visual Arts (SVA) and New Renaissance Arts Movement and held at Saddleback Rancho Capistrano Retreat Center in San Juan Capistrano. Saddleback Arts pastor Jason Leith and New Renaissance’s director J. Scott McElroy produced the event in partnership with a host of SVA leaders and volunteers on the ground. See the inspiring speakers (including Rick Warren) HERE, the amazing setting HERE, and the 20 sessions and workshops HERE. This was the first time the conference also featured a retreat and the effect was rich and wonderful. See the conference videos HERE. T he 2016 conferences were held in Indianapolis in June and Boise in July. Indianapolis was produced by New Renaissance Arts Movement and hosted by Indy Vineyard Church, a fellowship that has pioneered arts ministry since the early ’90s and values the arts as an expression of God’s love. It featured several sessions with speakers like acclaimed artist Makoto Fujimura, a field trip to the innovative Harrison Center for the Arts, and a stunning performance from Ad Deum Dance, Company, as well as over a dozen workshops. See the video titles HERE. See the speakers HERE. The 2016 Boise conference was produced by VineArts Boise in co-operation with New Renaissance. It featured renowned artists Roger Feldman and Scott Erickson and teachings on working with God, finding your own creativity, knowing your identity, the needs of artists, and loving people through the arts. See the video topics HERE. See the speakers HERE. 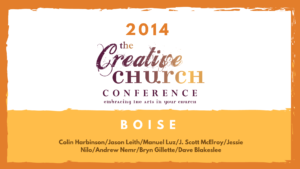 The 2014 conference was held only in Boise, and is was a doozy. Our session speaker list was packed with talent and wisdom (see speakers HERE), including such creative pioneers as Dr. Colin Harbinson, and wonderful artists like Bryn Gillette. TED fellow Andrew Nemr shared his incredible tap talent in a improv jazz Collaboration with Manuel Luz. See the Video tiles HERE. 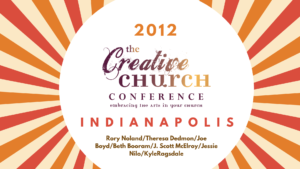 This was our inaugural year, with the first CreativeChurch Arts Conference in Indianapolis in June, and the second in Boise in July. Both events were covered in prayer and God “showed up” in wonderful ways. The conferences exceeded expectations and many lives were changed and new arts ministries born. Arts ministry pioneer Rory Noland (The Heart of the Artist) spoke at both events, sharing his teaching of caring for artists. 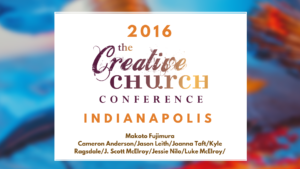 In Indianapolis, the conference (produced by New Renaissance) featured a mix of creative leaders from several Christian faith traditions, including Theresa Dedmon of Bethel Church, Redding, CA., a fellowship known for taking creative risks. The conference included a “Creative Room,” a space for creative processing, available all day, every day. 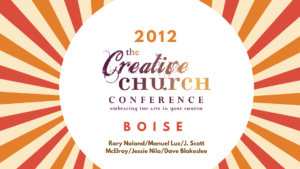 The Boise conference added Manuel Luz and special performances and workshops. See the video titles HERE. We value the arts, beauty, and imagination as expressions of God’s love. We recognize that God is the most creative being in any universe, and believe he is inviting his church to embrace creativity. We value artists as collaborators with God. We aspire to foster spiritual formation and growth in artists. We believe artists can help reveal God to their congregations and communities through their inspired expressions. We believe in facilitating growth in artist’s skills and practices. We value Christian artist communities. We recognize that artists can grow and flourish in community, and we seek to foster those connections, especially in and through local churches. We value the inclusion of multiple Christian faith traditions and backgrounds in our events and resources. We aspire to foster unity among creatives and churches of different backgrounds.We recognize that we can all learn from each other’s practices. We value practical teaching, modeling, and ideas. We gather experienced leaders to share reproducible best practices in arts ministry. We encourage attendees to share, interact, and cross-pollinate. We value prayer and personal ministry. We dedicate the conferences to God, looking for his will and direction in all elements. We enlist partners to pray with us before, during, and after the events. We aspire that every attendee would experience creative and spiritual renewal at the events. We provide platforms for thought leaders to inspire us to a future of creativity-infused faith.